鸟瞰美国：沼泽国家公园的红树林，The mangrove swamps of the Everglades, situated at the extreme southern tip of Florida, lie at the point of convergence of the fresh water from Lake Okeechobee and the salt water from the Gulf of Mexico. The Everglades have already been reduced by half in size by drainage and diking which began in 1880 to create greater urban and agricultural spaces. Since 1947 the 2,300 square miles (6,000 km 2 ) of Everglades National Park have protected one-fifth of the original wetland. Numerous and diverse fauna takes refuge there, particularly 40 species of mammals including the endangered manatee, and 347 species of birds. The biological importance of the site is unanimously recognized: a Biosphere Reserve since 1976, a UNESCO World Heritage site since 1979, and a Wetland of International Importance since 1987. 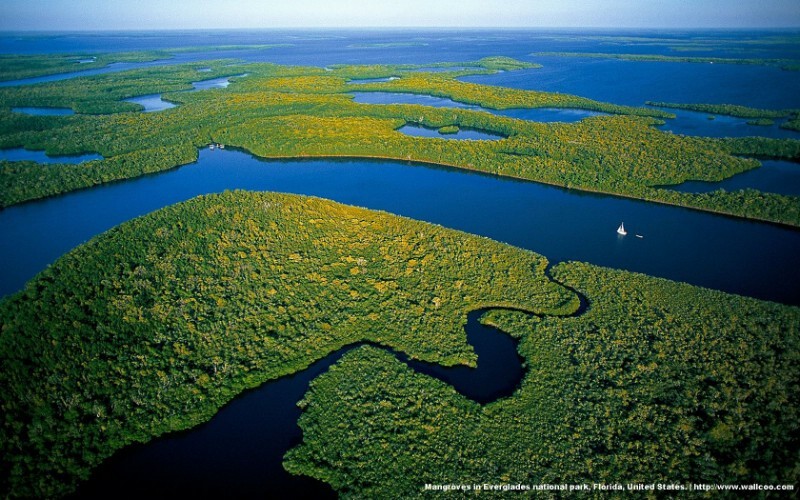 Despite this recognition, the Everglades were placed on UNESCO’s World Heritage in Danger List in 1993. Population growth (900 people move to Florida every day) and industrial, urban, and agricultural pollution have overwhelmed this outstanding site. To avoid an ecological and economic disaster, an ambitious and comprehensive program is working to restore the ecosystem, providing drinking water for the region and preventing seawater from entering the overexploited groundwater supply.